As of the census  of 2010, there were 111 people, 57 households, and 39 families residing in the city. The population density was 213.5 inhabitants per square mile (82.4/km2). There were 62 housing units at an average density of 119.2 per square mile (46.0/km2). The racial makeup of the city was 98.2% White, 0.9% Asian, and 0.9% from two or more races. Hispanic or Latino of any race were 0.9% of the population. There were 57 households of which 14.0% had children under the age of 18 living with them, 59.6% were married couples living together, 3.5% had a female householder with no husband present, 5.3% had a male householder with no wife present, and 31.6% were non-families. 26.3% of all households were made up of individuals and 3.6% had someone living alone who was 65 years of age or older. The average household size was 1.95 and the average family size was 2.26. The median age in the city was 53.9 years. 9.9% of residents were under the age of 18; 1.8% were between the ages of 18 and 24; 15.3% were from 25 to 44; 54% were from 45 to 64; and 18.9% were 65 years of age or older. The gender makeup of the city was 55.9% male and 44.1% female. As of the census  of 2000, there were 116 people, 51 households, and 42 families residing in the city. The population density was 204.6 people per square mile (78.6/km²). There were 55 housing units at an average density of 97.0 per square mile (37.3/km²). The racial makeup of the city was 98.28% White, 0.86% Asian, 0.86% from other races. There were 51 households out of which 21.6% had children under the age of 18 living with them, 74.5% were married couples living together, and 17.6% were non-families. 15.7% of all households were made up of individuals and 5.9% had someone living alone who was 65 years of age or older. The average household size was 2.27 and the average family size was 2.50. In the city, the population was spread out with 15.5% under the age of 18, 5.2% from 18 to 24, 23.3% from 25 to 44, 37.1% from 45 to 64, and 19.0% who were 65 years of age or older. The median age was 48 years. For every 100 females, there were 114.8 males. For every 100 females age 18 and over, there were 117.8 males. The median income for a household in the city was $43,750, and the median income for a family was $53,750. Males had a median income of $31,875 versus $19,583 for females. The per capita income for the city was $39,223. There were no families and 1.8% of the population living below the poverty line, including no under eighteens and none of those over 64. ^ Upham, Warren (1920). Minnesota Geographic Names: Their Origin and Historic Significance. Minnesota Historical Society. p. 557. 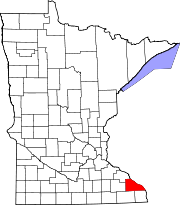 ^ "Wabasha County". Jim Forte Postal History. Retrieved 10 August 2015.